This two-part series explores new directions for FP&A in today’s fast-changing, complex business world, where the future is increasingly unpredictable, and technology has given organizations unprecedented abilities to analyze customer behavior. Organizations have always produced annual plans, quarterly forecasts, and monthly reports. In recent times, technology has enabled end users to access systems where reports and analyses can be produced at any time during the month. It’s also now possible to plan on a continuous basis and to totally integrate strategic plans with operational plans and forecasts. Yet this rarely happens. All agree that continuous planning is essential, as is the focus on strategy, but what makes this so hard to achieve? At the heart of the problem are the traditional management processes, which are long overdue for a complete overhaul. 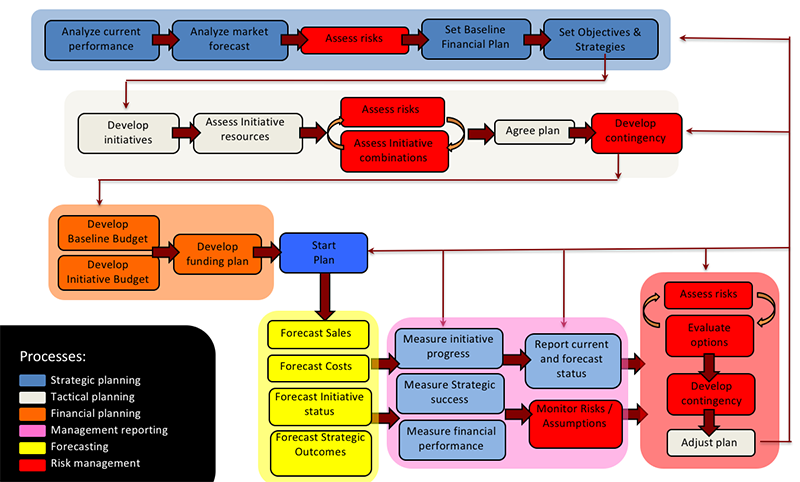 Six management processes widely used today by FP&A have their roots in the early 1900s: strategic planning, operational planning, budgeting, forecasting, reporting and analysis, and risk management. Over the past 20 years or so, there have been attempts to streamline this model, including initiatives such as the balanced scorecard and “beyond budgeting.” While these have their supporters, quite often organizations embrace just part of the chosen model. To truly redefine planning, it’s vital that organizations adopt a process that they can own and makes sense for their situation. The place to start, no matter what management methodology you subscribe to, is to map out your own current processes that cover these six areas. You can do this by describing the tasks that can answer the questions that each process poses, such as the following. What are our strengths and weaknesses in our chosen market? What risks do we run, and what could we do to achieve our overall corporate aims? What are the baseline funding targets? Do we need to change our overall objectives and mode of operation? What can we continue to do as at present? What new initiatives do we need to implement? What combinations of initiatives give us the best chance of success? What contingencies should we plan if this does not work? What is the baseline budget – overhead, income, and related costs? What budgets should be assigned to new initiatives? How will cash flow be funded? What does our income look like over the next “N” months? What are the predicted costs? What is the status of new initiatives? What are we forecasting for our overall goals and objectives? What is the status on initiatives/finances compared to plan? Is the business environment as we envisaged? What new risks do we run? What needs to change in our initiatives, and what contingencies should we put in place? In doing this analysis, it’s important to remember that these are not six distinct processes. You should be able to draw these tasks as a map that shows how they flow and interact with each other. Below is a summary example. You will probably need to do this in more detail. The next step is to identify what would cause each task to be triggered. Some tasks will naturally follow on from the completion of others, while some may be triggered by multiple causes such as exceptions or particular events. These links will identify loops within particular processes or connections to other major processes. Now we need to note the people involved in each task, what information they require, and what data they need to pass on to someone else. By the end of this investigation, you should be able to take a long, hard look and see where the process can be streamlined. You can then share the result and gather feedback about the changes needed to make this revised process a reality. In Part 2 of this series, we’ll take a look at the changing role of FP&A.